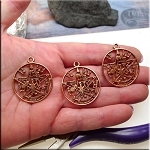 Tetragrammaton Charms and Pendants - Pagan Mysticism - 'Tetragrammaton' is the holiest name of G-d. It is comprised of the four Hebrew Letters YHVH. In the words Yud-Hey-Vay-Hey, we find the mystery of the Tetragrammaton (the Holy Four), and it is the occult key that unlocks the meaning behind astrological symbolism, the tarot, the mysteries of the Old Testament and the Book of Revelation.